Each quarter, we get the JP Morgan “Guide to the Markets” which I think is chock full of good economic and market data. Dr. David Kelly and the JP Morgan analytical crew do a nice job compiling this 70-odd page summary and release it within the fisrt 24 – 48 hours of each new quarter. 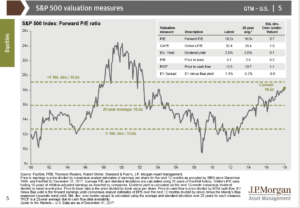 The “SP 500 Valuation measures” page is one of the most important in my opinion. 1.) The Sp 500’s P.E, despite the 21% return on 2017, remains reasonable at 18(x) earnings and in fact, given the 20% expected forward growth rate of earnings, the SP looks very cheap on a “P.E to growth” basis. 2.) The “EY to Baa” spread is still positive, which presumably is a “credit-adjusted” Fed Model gauge, indicates that the SP 500 earnings yield is still flashing green for the stock market. The latest flush in the US stock market was a nothing relative to historical corrections, and I wouldn’t be surprised to see more chop ahead for the SP 500 this year. However, given the above data and the continued health of the corporate bond markets, you’d have to say that we remain in a secular bull market for US equities. Here is a blog post written a few weeks ago talking about previous years with very strong SP 500 earnings growth and yet the benchmark returned little those years. With expected SP 500 earnings growth of 20% this year, 2018 could be a year of “P.E compression”. That doesn’t mean the bull market is over by any stretch of the imagination.